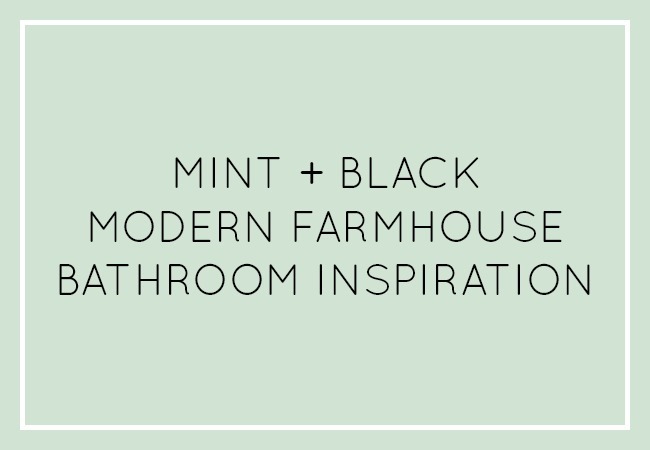 A design moodboard for a modern farmhouse style powder room makeover inspired by mint, black, wood tones, and skinnylap. Friends, I think I am going through project withdrawal. I've been daydreaming about our house since the day I first saw it. I have what seems like hundreds of ideas. My brain is working in overdrive! As you can imagine, moving and having a new baby has kept me a little busy, so I haven't had time to do a project in a while. But I thrive off of creativity, and my soul is just begging me to get back in the saddle. Now that we are feeling a little more settled into our new home, and we have adjusted to life with two kiddos, I'm ready to tackle my first project! I decided to start small and work on our powder room. 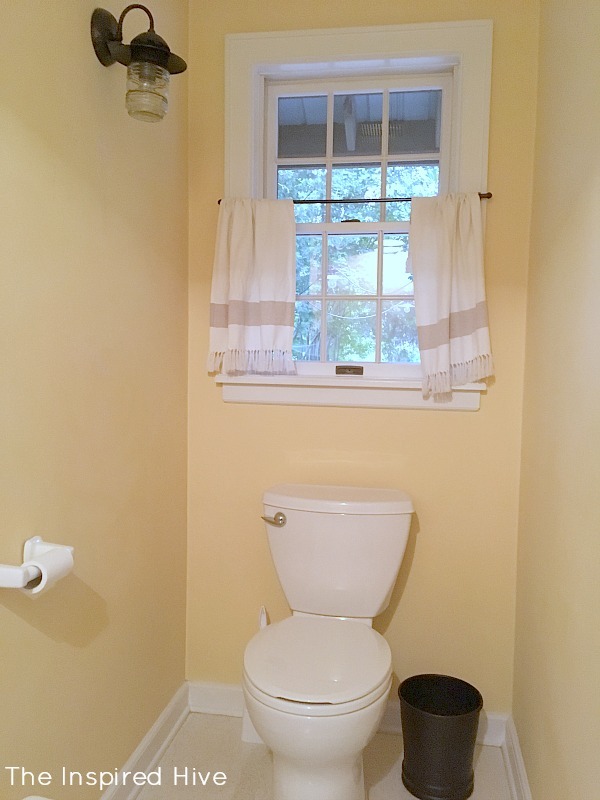 This room is in some serious need of some love, and since it's the bathroom that will be most used by guests, it made sense to put it high on our priority list. 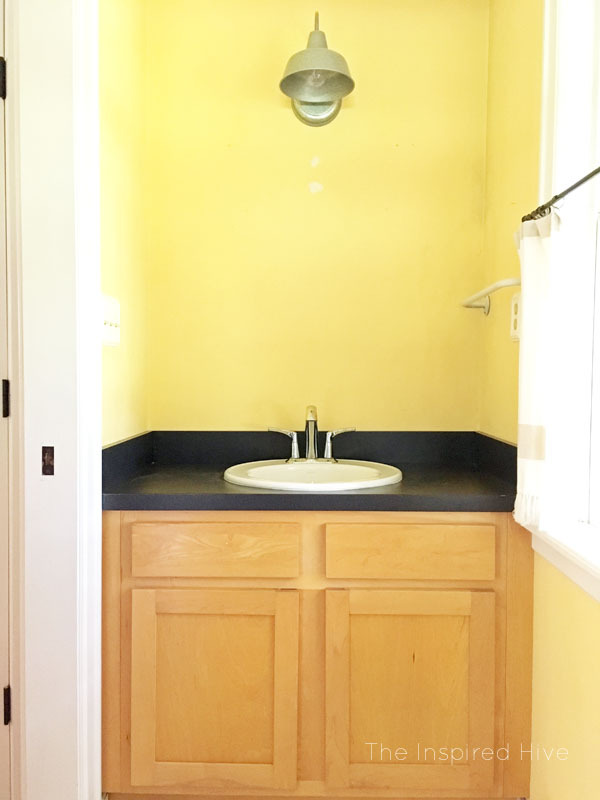 When we moved in, this bathroom was painted yellow, had some half spackled holes, no mirror, and an old linoleum sheet floor. The cabinetry isn't terrible but could use a little facelift, and it actually has great lighting. Here's what it looks like now. If I'm being totally honest with myself, this makeover will probably take me a little longer than it normally would since I've got two kiddos keeping me busy now. I'll work on it a little at a time with a goal of the bathroom being complete by the holidays. Here's what I plan on tackling. 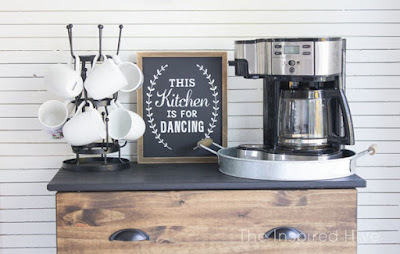 If you saw my modern farmhouse kitchen makeover in our old house, you know I've got a thing for combining black with wood tones. I still love that look, but I'm also craving a little color, so I'm throwing in my favorite color. I have always been a fan of all things in the mint/aqua/teal/turquoise family. It just feels natural to add it to my home! And after totally falling in love with my skinnylap feature wall in the old house, I have to add some skinnylap here too. 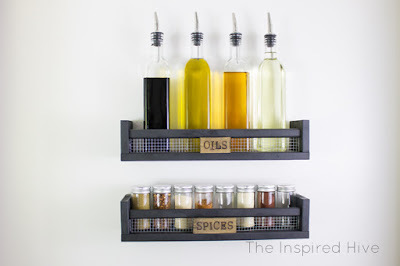 Here are some of the other beautiful things that are inspiring my design for this space.